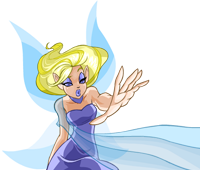 To the north-east of Neopia Central is a large lake formed within the caldera of a long-dormant volcano. Although you can't see much from above the surface, below is a underwater village where over a thousand Kikos make their home. For those of you that can't breathe underwater, you can try the Glass Bottom Boat Tour or investigate some of the onshore shops.